Christopher Nolan’s genre-b(l)ending, unconventional masterpieces elevated him to the status of geek guru. There is the twisty, haunted and haunting psychological thriller, Memento. There is the truly magical performance in The Prestige that challenges notions of love, tragedy and sacrifice. There is the permanently marked by Heath Ledger’s genius The Dark Night: audacious, ground-breaking and perfectly balanced, both as a comic rendition and a sequel. There’s Inception: magnificent as an eye candy, original and imaginative as a study of the art and power of cinema, and yet full of empathy as it deals with loss and memory. Dunkirk was supposed to be his first “serious”, down to Earth, based on real, historical events film. So, nobody knew what to expect. Would he follow Steven Spielberg’s example and forsake his glorious geeky past for a more grown-up, awards-winning career? Or, would he, inexplicably, pull a Michael Bay and turn a factual, war tragedy (like the one at Pearl Harbour) into a pompous, patronising spectacle? Well, it turned out, he did, emphatically, neither. And as the Summer ends, let’s explore how Dunkirk became the most critically acclaimed and the only non-fandom movie in both the top five of the season’s American and the top 15 of the year’s world-wide box office thus far. It takes a while for a single word to be spoken on screen: “English” shouts a very young soldier in French with a thick English accent. He is allowed to take cover in the French fort before he is hastily and rather non-verbally guided to the beach, where his compatriots await rescue. And then again, it is a while longer for another piece of meaningful dialogue to be heard as this theme of verbal scarcity is constant throughout Dunkirk. Actors articulate only what is absolutely necessary. One example of this is when Commander Bolton states that the British military cannot evacuate the 400,000 stranded soldiers in time. Another is the irony of Churchill’s heroic words being read by a broken, boy soldier, at the end of the film. Most of the other dialogue is practically inaudible or consists of scattered words. Dunkirk, you see, is nearly a silent film. It tells its story not with words, but with motion pictures accurately edited with fitting sounds as Hans Zimmer’s brilliant original music guides the pace of your heart with the appropriate tempo, communicating everything of substance in an uncensored, raw way. Case in point: the stretcher scene. After exchanging only a few looks, two soldiers understand and agree to perilously carry in haste one of the wounded to the hospital ship as a means of escaping the beach. This narrative’s attitude of mistrusting (imposing) words is extended to Nolan’s choice of actors. The “main” character, Tommy, is played by an unknown youngster named Fionn Whitehead. Tom Hardy, who is now practically worshiped by fans and critics alike, once again (after The Dark Night Rises) hides most of his face behind a Spitfire pilot’s mask. The super star Harry Styles is borrowed from the pop music arena and is – to his and his director’s credit – unrecognisable. And while there’s Mark Rylance as Mr. Dawson, Cillian Murphy as his first, rescued passenger, Kenneth Branagh as Commander Bolton and James D’Arcy as Colonel Winnant, they are mainly known as either supporting actors or for their work behind the camera, and can barely be considered true celebrities. No. The humans in this film are not larger than life: they are and could be anyone. You or me. Just people struggling to stay alive. Early on Dunkirk maps out the different locations (The Mole/Earth, The Sea and The Air) and timelines (one week, one day, one hour, respectively) of each of the three threads of its narrative. Nolan does this simply and quietly, with a small piece of white text on the screen and no further explanation. So, you settle in your impression that the drama unfolds linearly and that the three stories occur concurrently. Except then it’s in the dark of night that one of the rescue ships sinks near the mole, but the events in the sea and in the air still transpire in the light of day. The suspense that has been drumming your stomach is now augmented with senses of disorientation and anxiety as you realise that there a lot of people still stranded on the beach , having no idea that help is on the way. You grasp the danger Mr. Dawson’s mission is already in , miles away from the beach. And you feel deep in your core the bubbling panic of the rescued from the sea, shivering soldier, when he repeatedly, muttering or shouting, states, “I’m not going back”. Time is broken as events of the past (earth), the present (sea) and the future (air) happen in tandem on the screen. The three timelines converge only for a few moments, around and aboard Mr. Dawson’s boat, well past the mid-point of the film’s duration, before they break apart and never meet again. 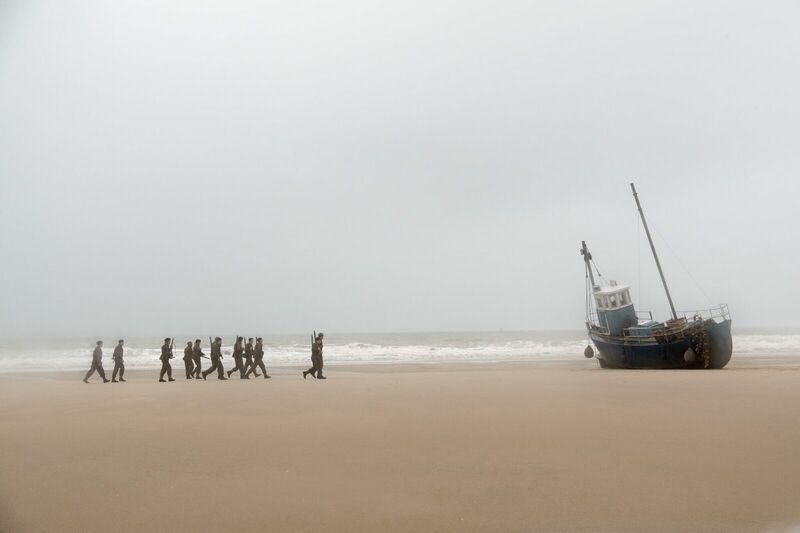 This lack of temporal regularity, of a clear beginning and a definite ending makes Dunkirk an interactive experience. Yes. This storytelling creates a bond between the viewer and the characters: like these humans stranded on the beach or in the sea, you feel uncertain and maybe even terrified. You are there, with them. You don’t know or care if it’s day or night, if you win or lose the war, who is friend and who is foe. What matters is to stay alive. There are shootings, air fights, bombs dropping and ships sinking throughout the film, but Dunkirk does not actually explore this typically loud, bloody war. Instead it traces the one that comes after: the – soundless and bloodless – one fought deep inside and on a personal level, experienced as a common and at once a very lonely experience. This is the war that never really ends. This is the war that strips everything away, apart from a ruthless survival instinct initially, and a brutal survivor’s guilt subsequently, when you are about to return to some kind of normality, of an everyday life. Where neither the instinct nor the guild can serve or save you. Where you are left naked, humiliated, wondering what was the point of all that you’ve survived. No matter the reassurances, or the gratitude you may receive, from Mr Dawson, the blind man welcoming you home, or the words of Churchill you read aloud from the newspaper. The latter in particular sound hollow, alien on your tongue, and anything but victorious, as they seem to speak about someone else and something else. In tune with the proclamation of this film’s tagline (“Survival is victory”) the reality is that there are no war heroes here. No sense of accomplishment, fulfillment or redemption. As the fate of the haunted soldiers Mr. Dawson rescued on his boat, or the Spitfire’s pilot just captured by the Germans back on the beach you remain uncertain. Pendent. Thinking that if there is a hero here, this can only be George – Mr. Dawson’s young, wide-eyed shipmate. A boy who has never been to war or carried a gun. The only one who bleeds, and meets a certain faith and is specifically named and remembered in the paper. But then again, no. You are not sure. You cannot settle on an answer. Is George the hero, or just an innocent victim? Uncensored by words, stars or heroes, fragmented in different timelines and points of view, with Zimmer’s evocative soundtrack acting as its “spinal cord”, Dunkirk is not meant to be watched. Is meant to be experienced. Viscerally. Deep inside. On a very personal level. By all of us, geeks, intellectuals and mainstreamers, together. Yet, simultaneously, by each of us so desperately apart. That is why there is no digital spectacle here, or high-tech CGI. A passionate advocate of film, Nolan shot about 70% of Dunkirk in the full 70mm IMAX format, with a combination of 65mm IMAX and Super Panavision film for the remaining 30%. At the same time he insisted on using real boats, real Spitfire planes, real places, real people and old fashioned, handmade special effects to re-enact the action on the earth, in the sea and in the air. He thus composed moving images that are breath-taking in scale, clarity, texture, and, yes, beauty. But his greatest feat is how seamlessly, disarmingly immersive these images are. They are not meant to impress or to distract you. Only to pull you in. Yes. Inescapably deep, into the war within. Where words fail you and time has no meaning.